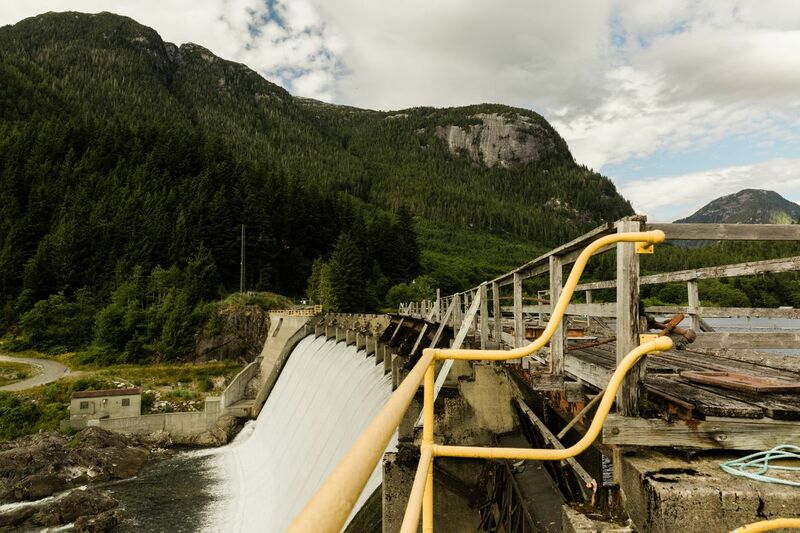 The hydro dam in Ocean Falls, British Columbia, on July 17, 2018. Bloomberg photo by Jackie Dives. The security provided by the mill turned out to be fleeting. It went silent when Strebel was in his 20s. Most of the buildings in Ocean Falls that haven't been demolished over the decades are crumbling in place, and Strebel, along with most everyone who once lived there, is long gone. A population that peaked at 5,000 has fallen below 100. 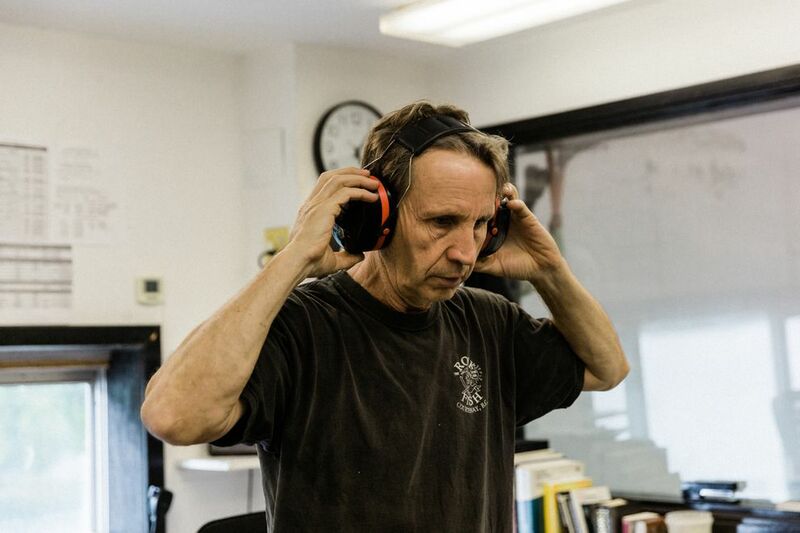 But this summer, the mill began to emit a new sound. It was more of a buzz than a throb, really, but plenty loud to be heard as far away as the ferry dock and the old firehouse. It was the noise of hundreds of tiny fans blowing air past hundreds of tiny computers, keeping them cool while they ran 24 hours a day, creating bitcoins. The bitcoin mine has come to Ocean Falls after almost four decades of false starts. The town went dormant once the paper industry left, but it wasn't dead, exactly. The dam that powered the mill was still capable of producing about 13 megawatts of electricity. Some of that went to power Ocean Falls and two nearby towns, Bella Bella and Shearwater. But even in the middle of winter, their residents used less than one-third of the electricity, leaving plenty to support new industrial uses. The dam wasn't connected to the grid, a shortcoming that could also be an advantage in the right hands. Any power-hungry business willing to set up nearby would be well-positioned to negotiate a sweetheart deal. For most industries, the remoteness of Ocean Falls offsets the benefits of cheap power. It's about 300 miles up the coast from Vancouver, accessible only by boat or seaplane. Strebel's teenage protestations aside, severe weather is a real issue. It's one of the rainier places on the continent, and high winds in the long winter months can hinder travel. And so almost every plan-for casinos, breweries, marijuana-growing operations and water-bottling plants-came and went with little tangible impact. At one point, a group of businessmen sought to fill ocean tankers with water from the town and sell it to California or Saudi Arabia. The only substantial business for now is a salmon hatchery. Miners who inquired about Ocean Falls were mostly routed to Brent Case, Boralex's operations manager for British Columbia. Case didn't really know what bitcoin was but he was always interested in a chat. Case is a self-described bush person who will happily regale listeners about what it's like to live on a boat for a month stringing power lines through the Canadian wilderness, or that time a grizzly bear nearly scalped him alive. Case was also perhaps the most prominent resident still left in Ocean Falls. He soon realized the speculators blowing up his phone had no clue as to how to carry out what they were proposing. "A lot of the bitcoin people, and blockchain people, and you name it, they think they can come in and do a project without doing their homework," he says. This wasn't new to Case, who says there have always been "all kinds of concocted people coming through Ocean Falls." But he was on the lookout for a savior for the town, so when he heard the seeds of a credible plan, from a Vancouver-based businessman named Kevin Day, he jumped on it. With Case's help, Day has spent the last 2 1/2 years converting one floor of the old mill into a data center. He flipped on the first batch of servers in July. Even with the bitcoin mine now operating, there are more questions than answers. As other places courted by bitcoin miners have realized, such facilities provide almost no permanent jobs and create little incentive for related businesses to locate nearby. The same would be true of data centers serving any use. But bitcoin comes with its own set of uncertainties. When Day first contacted Case, a single bitcoin was worth about $400; by last December it had risen to almost $20,000. If nothing else, Day's company looked like it might become a solid, long-term customer for Boralex. Then, just as the money was about to start trickling in, bitcoin crashed. Ocean Falls is tucked away in a breathtaking stretch of British Columbian coastline. Steep mountains covered in pine forest emerge from wide channels emptying out into the Pacific Ocean. For miles, the only sign of human presence in the boat ride to Ocean Falls is a single power line stretching out from the dam. 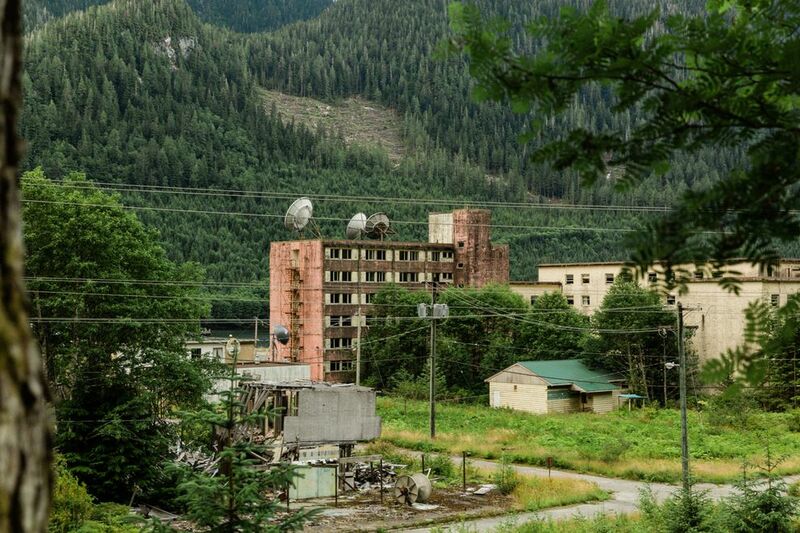 As visitors approach the dock, one of the first things they see is a large, abandoned hotel. The roof has partially collapsed, but the structure is still in better shape than the building directly across the street. The old mill complex stretches out to the right behind a locked gate, and the dam is a 10-minute walk up a hill. The buildings along that stretch are in progressively worse condition, and soon, most of the lots are just tall grass. Most of the residents live down a road that hugs the coast, away from the ruined former downtown. The one real public business is a bar, Saggo's Saloon, which opens on Monday, Wednesday and Friday from 4 p.m. to 7 p.m. Abandoned buildings in the downtown area of Ocean Falls, British Columbia, on July 17, 2018. Bloomberg photo by Jackie Dives. There's still a post office in town; the government recently built a new ferry dock and is planning to connect Ocean Falls to a fiber optic broadband line, a public works project that baffles even some of the locals. But outsiders mostly think of Ocean Falls as a ghost town, a view reinforced by a handful of television documentaries and websites cataloging forgotten places. Day is a hearty-looking, athletic type in his mid-40s with an entrepreneur's unflappable optimism. Beyond that, there was nothing to indicate he'd be qualified to build a data center in the middle of the wilderness. He lived in a high-rise apartment building in Vancouver and typed on a computer for a living. When asked what he knew about electrical engineering, Day says the answer was: not much. "I know computers use electricity," he offers. Day pestered Case constantly by phone, then began traveling up to Ocean Falls from Vancouver. For the myriad technical questions he faced, he developed a strategy that was notable for its simple elegance: He'd just have Case figure it out for him. This was clever, and not just because Case had answers. Once enlisted as a co-conspirator, Case began advocating for Day within Boralex. Eventually, the utility agreed to sell power to Day's company, Ocean Falls Blockchain, at a steeply subsidized rate for a five-year period. The preferred price was all that made Day's operation financially viable. Neither Ocean Falls Blockchain nor Boralex will discuss the financial terms of their agreement. But in February, Ocean Falls Blockchain prepared a presentation for investors claiming it would pay less than 5 Canadian cents (less than 4 U.S. cents) per kilowatt hour of energy. That's a strikingly low rate, less than half the rate Boralex charged to send power to the towns of Bella Bella and Shearwater, even back in 1986. (The current rate Boralex charges is not public.) Another bitcoin miner in the area described the rate Day was paying as practically free. Ocean Falls Blockchain told investors it would start off small, and would be buying 6 megawatts of energy from Boralex by the end of 2018, bringing in about $5.7 million in annual revenue from the bitcoins it created. The company planned to increase its energy consumption at Ocean Falls to 20 MW, then expand to other nearby locations. By 2021, it said, it'd have over 17,500 bitcoin mining units drawing over 30 MW of power. Day began shipping hundreds of Bitmain Antminer S9 mining units-the specialized computers whose sole purpose is to run the calculations needed to create bitcoins-from China. He bought a transformer that weighed over half a ton and paid to have it transported as far as possible by truck and then barged in the rest of the way. He took over one huge room in the structurally soundest building left in the paper mill complex, where he installed huge fans on either side to pull cool wind through, offsetting the heat the machines would produce. The visitor from Vancouver became the biggest story in town. Day's construction contractors filled a boarding house run out of a building that used to be Ocean Falls' bank. Day regularly stopped by Saggo's for a few cans of Budweiser and a round of friendly blockchain-themed quizzing from the locals. He even persuaded Case to sell him his house, the biggest one in town. Case had spent years renovating it, allowing Day to operate from the illusion of suburban comfort-so long as he didn't look out the window and notice his house was the only one in sight not in danger of falling over. Despite the local buzz it created, Ocean Falls Blockchain was facing significant headwinds. In 2017, the company began preparations to raise money to buy equipment and cover construction costs by going public on Canada's junior stock market. This was a popular tactic among bitcoin companies at the time. It let them offer themselves up as vessels for people who wanted to speculate on cryptocurrencies without actually buying them. But shares in those companies crashed once the price of bitcoin stopped rising, and Day's team pulled back. In Day's mind, he dodged a bullet, and he says he has other ways to fund the business. Keith Cockell in Ocean Falls, British Columbia, on July 17, 2018. Bloomberg photo by Jackie Dives. There was little way around the issue of the price of bitcoin itself, though. When it approached investors in February, Ocean Falls Blockchain had made its financial projections based on a bitcoin price of $11,000. A lower price would mean Day's business was less valuable in the non-bitcoin economy, even if it created the same number of coins. By the time it actually turned its first servers on in early July, the price was under $7,000. Over the last year, Day has consistently shrugged off the big drops in prices, noting that Warren Buffett doesn't fret over short-term moves in the stock market, either. He says he knew bitcoin was volatile, and expects prices to rise over time. This year's cryptocurrency crash is pushing some miners to reconsider their plans. Harry Pokrandt, the chief executive officer of Hive Technologies, a larger mining firm, has begun exploring how to flip his servers between mining and other cloud computing tasks such as video processing, depending on what's more profitable at any moment. Pokrandt says smaller miners without efficiencies of scale are being squeezed even harder. "We get approached pretty often from guys who want to sell their operations," he says. Pokrandt says Ocean Falls Blockchain hasn't been one of them. Day is also unable to access as much power as he had anticipated. Right now, the bitcoin mine draws less than a megawatt of electricity. Day plans to be up to about 1.5 MW by the end of the year, a far cry from the 6 MW he was expecting. The path to growing his operation to the tens of megawatts is even less certain. Boralex still has significant surplus energy at Ocean Falls, but it is holding back due to a dispute with BC Hydro, the local public utility, over the price it charges to send energy to its residential customers. Case is worried that a potential result of that dispute, which is currently in arbitration, could be a mandate from regulators to charge Day's group a rate high enough to drive Ocean Falls Blockchain out of town. This wouldn't be the first time that government entities have soured on partnerships with bitcoin miners. Regulators in Quebec are working to set higher rates for miners there as it considers how to protect access to power for residential customers. Officials in Washington state have clamped down on bitcoin miners after they began setting up there in large numbers. The miners' hunger for power could impact the existing markets, and the air of speculation around cryptocurrencies is a potential political liability, especially given that they provide few jobs or other traditional markers of economic development. Toni Ziganash moved to Ocean Falls years after the mill closed. First, she came just in the summers, before establishing a more permanent foothold this year. She runs LeMarston Lodging, the boarding house in the old bank building. Ziganash pines for a local economy that could at least support a grocery store, so she wouldn't have to barge in all her food. But she's doubtful Day will be the catalyst for that transformation. "How many people does it take to keep a bunch of computers running?" she says. "Probably not many." For Ziganash, Day's contribution to Ocean Falls is more intangible. His arrival in town has meant there's at least one person looking firmly toward the future. "We have a very aging population here, and when I say aging, that means 70 and up. So there's not a lot of energy. There's not a lot of enthusiasm for anything new, to tell you the truth," she says. "So I would just like to attract some younger people to come in." Day never promised to do that, although he does have plans beyond a mining facility. Ocean Falls Blockchain is developing a method for cooling computers that entails immersing them in non-conductive liquid instead of blowing air past them. Day also wants to experiment with redirecting the heat from his mine to the salmon hatchery, providing it an inexpensive way to warm the water in its tanks. Both types of technology could theoretically then be sold to other bitcoin miners and data center operators. Meanwhile, the people Day would hire to develop them would spend at least some of their time in Ocean Falls, working at the data center and-maybe-buying groceries. Day also thinks there'd be hunger for other urbanites to spend some time in the wilderness at a kind of laboratory for blockchain technologies, an idea whose merit is so far untested. Keith Cockell, an Ocean Falls native whose father was a dam operator when he was a kid in the 1950s and '60s, is already declaring victory of a sort. Cockell left Ocean Falls, then returned in the 1980s to help Case build the transmission line to Bella Bella. Now he has a house in town and works at his father's old job.